What is EdPuzzle, you ask? EdPuzzle is a site that allows users to select a video and easily customize it by editing, cropping, recording audio and adding questions to make an engaging presentation or learning experience. It is also a great formative assessment tool; a unique way for students to demonstrate their understanding. 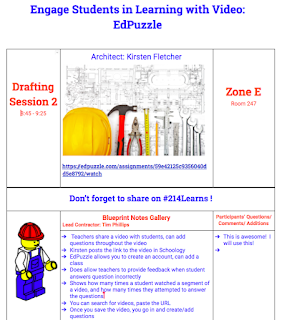 Kirsten Fletcher has found EdPuzzle to be a great tool to engage her students in learning and she facilitated a workshop to share with her colleagues for our October 2017 Institute Day. We have heard from several teachers who attended her session about how Kirsten's examples have inspired them to use EdPuzzle in their own classes. The notes from the session serve as a great resource for those that missed it and due to popular demand, Kirsten has offered to repeat the session for our Teaming on Tuesday Learning Lab on October 24th. We hope you'll join us! Not at EG? You can join us remotely! Just send us a direct message to the Collab Lab Twitter, and we'll send you a calendar invite and link to join us via Zoom!